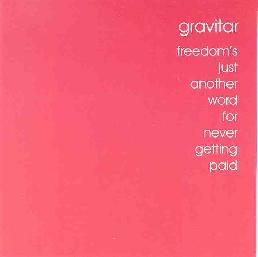 Gravitar - "Edifier" / Gravitar - "Freedom's Just Another Word for Never Getting Paid"
On their web site, Gravitar dub themselves "the unholy mix of Sun Ra and Black Sabbath you've always dreamed of." I think they've hit the nail on the head. Gravitar explore a style quite their own, with huge, intense heavy metal jamming colliding with the expansive and experimental nature of free jazz, it may be unlike anything you've heard before. Their latest releases, Edifier and Freedom's Just Another Word for Never Getting Paid are actually lost albums of sorts. Both were recorded in 1997, but are only finally getting to see the light in 2001. Still, they are valuable additions to the Gravitar catalogue. I first listened to Edifier right after listening to Monster Magnet's Spine of God album, and the transition was quite seamless. The first track on Edifier, 11/22/97 is a brutal jam that sounds not unlike Monster Magnet's earlier more chaotic moments. The sounds are wild, shrieking, and frightening sounds. 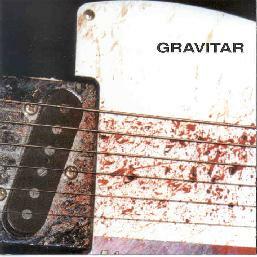 But Gravitar manages to slide effortlessly from free experimentation to psychedelic jamming and back again. In between their jams, they do actually do a few songs, including a cover of Skip Spence's Diana (from his legendary acid casualty album Oar) that features a nice, wasted sounding group vocal. Other standouts include 11/23/97, a terrific jam full off odd, off kilter sounds including discordant piano, and something that sounds like it could have come from a street band in China; and the marvelous Rocket to Dearborn, a dark, moody excursion full of psychedelic sound effects, that slowly builds in intensity to an explosive climax. Freedom's Just Another Word for Never Getting Paid is a bit of different beast. With five title tracks, ranging in length from 6 minutes to 16 minutes, Freedom is less structured than Edifier, and explores even more edgy territory than the latter. This is really one long, intense jam session. I must admit, for me, it was a little hard to get through. The intensity of the music is quite relentless. Certainly, there are quieter passages, but they are perhaps even more freeform than the louder parts. If I had the tolerance, I could sit and listen for hours, obsessively searching for patterns in the chaos. And patterns do emerge. Geoff Walker (vocal, guitar, horns), Mike Walker (guitar), and Eric Cook (drums) are not merely noise mongers; they do have a sense of musical direction that propels the jams forward. But make no mistake; this is challenging listening in the extreme, definitely not the kind of album to relax to, or drive to, or even do work too. It's agitating, and constantly demands the listener's attention. If you're up to it, it can be quite a rewarding experience. For more information you can visit the Gravitar web site at: http://www.simulated.net/gravitar. Contact via snail mail c/o Gravitar; PO Box 7554; Dearborn, MI 48121. Visit the Manifold Records web site at: http://www.manifoldrecords.com. Visit the Enterruption web site at: http://www.enterruption.com.